The design of the CAPSIZE-class cruisers, introduced into service in 2225, reflected a further development of the trends that had been established with the first post war Romulan cruiser design, the CATARACT class of 2175. The engineering portion of the hull continued to become larger, and the impulse deck grew wider. 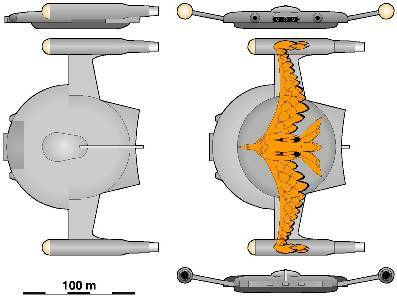 The nacelles, which again strongly resembled Federation nacelles were separated from the hull by 40-m-long pylons.